UPDATE: This promotion and iPad giveaway has ended. Go here to see what’s new. We’re doing something special for the Top QuiBidders Leaderboard contest in July. So far this promotion has been a fantastic way for the QuiBids Facebook community to continue to grow. We’ve watched you guys make lasting connections while sharing both successes and failures so other bidders can learn from your experience. Since there is so much great stuff being posted on our Facebook page on a daily basis, we decided to give you even more opportunities to win rewards for your contributions to the Q community. Now we’ve added another category of rewards to those already in place – ten users out of the Top 75 QuiBidders will be chosen at random to win a 1X Gameplay. However, we’re not stopping there. For the month of July 2014, we will be giving away a brand new iPad! 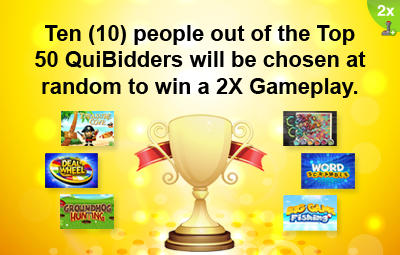 To be eligible to win, you must opt-in to the Top QuiBidders Leaderboard. If you are unfamiliar with the Top QuiBidders contest, we suggest reading about it here. How do I win the iPad? Every so often, we come across a customer’s post on our Facebook page that makes us go, “woah, that’s a great post!” So we decided to do something different this month to recognize a user who goes above and beyond with their posts on our timeline. Once July is over, we’ll select our favorite post throughout the entire month and award its creator with an iPad! Regardless of your Leaderboard position, it only takes one great post to win this popular tablet device. Here are some things to keep in mind if you’re looking to score this iPad. 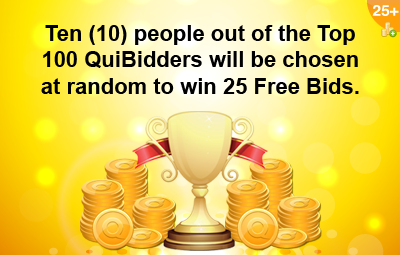 You must opt-in to the Top QuiBidders Leaderboard to be eligible to win. When you access the Top QuiBidders app for the first time, you’ll be prompted to opt-in to the Leaderboard so you can be eligible to win the rewards. Make sure you approve all the requested permissions otherwise you won’t qualify to win anything. Your post must be on our Facebook timeline and not on your own timeline. Remember to post on our Facebook page so we can see it. You can “enter” as often as you’d like. You can post as often as you like, but please don’t be spammy. As per our prior blog post, if you don’t want to risk losing TQ points we suggest spacing your posts out 4 hours apart. The more informative/creative/engaging your post is, the better. Whether you write a song, perform an interpretive dance, or share a story about how QuiBids has changed your life for the better – the more creative, relevant, and sincere your post is, the more likely we will like it. If you are posting a photo or video on our page, use a little extra effort to make sure it has good image and sound quality. Use appropriate lighting to keep your photos and videos from becoming too dark and grainy. Photos and videos that are taken in a bright and well-lit room or outdoors in the sunlight tend to look the best. Also if you’re making a video, be sure there are no background noise distractions like the TV, lawn mower, or a vacuum. You can either upload your video to YouTube and share the URL on our timeline, or you can post it directly to our Facebook page. Either option is fine with us. We love learning everything about your experiences with us. Try not to leave anything out in the descriptions of your posts. For example, if you’re posting about an item you won, tell us why you started bidding on it, how many and what kind of bids did you use, the ending price, how you felt after winning it, etc. The more descriptive you can be, the better your chances are of winning the iPad. Good posts have a better chance of getting shared, which means more TQ points for you! We have also started sharing your posts that we like with our Facebook fans. If we share one of your posts, that doesn’t mean that you won anything. However, it does help to give you a boost in Top QuiBidders points. So remember to keep posting great content this month. Even if you don’t win the iPad, there’s still a chance we could share it so you can improve your Leaderboard position. That’s it! To recap, we have listed all the rewards available to you below. Ten (10) people out of the Top 25 QuiBidders will be chosen at random to win a 5X Gameplay. Ten (10) people out of the Top 50 QuiBidders will be chosen at random to win a 2X Gameplay. Ten (10) people out of the Top 100 QuiBidders will be chosen at random to win 25 Free Bids. Five (5) people out of the entire Top QuiBidders Leaderboard will be chosen at random to win 10 Free Bids. All you have to do is opt-in to the app and you’re entered! What do you think of updates to the rewards? Sound off in the comments! *The iPad giveaway will only apply to the July 2014 Top QuiBidders Leaderboard winners. ** The new 1X Gameplay will now be included as a permanent reward for the Top QuiBidders promotion. Top QuiBidder Contest – What You Need to Know! 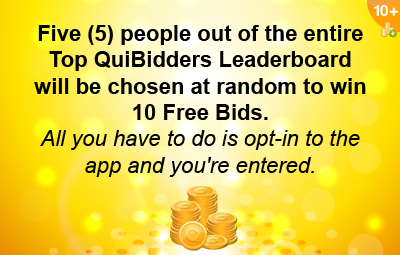 The Top QuiBidders Leaderboard – Earn Free Bids and Gameplays!